Guide4WDW.com: What to Pack When Attending the Parks Around the Holidays! What to Pack When Attending the Parks Around the Holidays! This is my most important tip. When traveling to Orlando in the winter months, the weather can be anything but predictable. This means temperatures can range from 40-80 degrees in any given day (and often throughout a single day). I know what you are thinking: How can I possibly dress for that? What I’ve found works best is to wear long pants that can be rolled up or capri pants each day. If you’re a male, you will have to decide if your legs can brave the cold mornings and evenings for shorts. If not, you’ll be stuck with pants. – Sorry boys, you get the short end of the stick with versatility. For the upper half of the body, I recommend wearing two layers. In the morning, the temperatures are usually (not always) around mid 50’s. This seems unusually chilly in Orlando where you are expecting a hot and humid climate. A good bet is to wear a short sleeved t-shirt (or ¾ sleeve for ladies) paired with a light sweatshirt or sweater. This will take the edge off of the chill without leaving you sweaty as the day warms up. If you are a backpack carrier, stash your sweatshirt into your bag when the temperatures near 70. Because I like to pack as light as possible for the parks, my choice is to tie my sweater around my waist. This may not be the most fashionable choice, but I promise you will tire of carrying it around! Winter is not Florida’s rainy season, but that does not mean a famous WDW 15 minute shower can’t appear out of nowhere. Half of the battle with packing for Disney is being prepared. Being soaked to the bone at the back of Animal Kingdom is enough to ruin anyone’s day. Don’t let that be you! Before making your trip to Orlando, stop by your local Dollar Tree for some disposable ponchos. These are very light and take up little space in your park bag. You can thank me later! 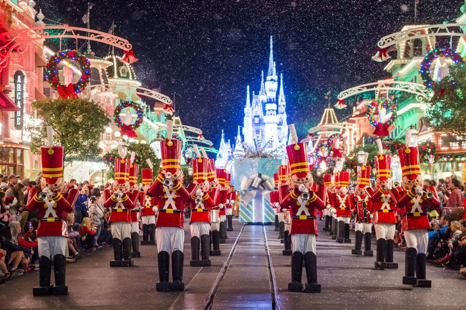 Traveling to Disney in the winter means the parks are packed with holiday festivities. Be sure to join in the fun by wearing holiday-ready pieces too! One of my favorite holiday accessories is a Disney Christmas T-shirt. Linked below are a few of my favorites. 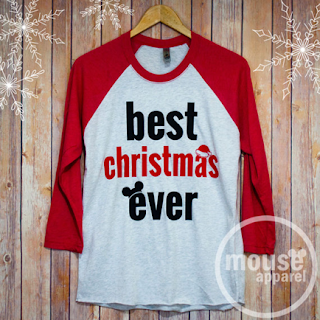 You can also pick out some Christmas Mickey ears or Santa hats. 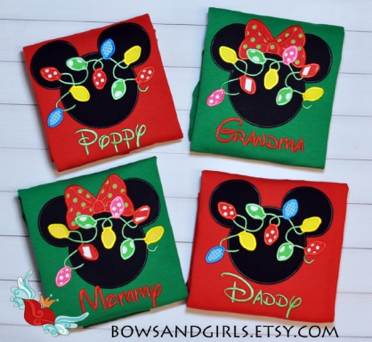 If you want to save a little cash, visit your local stores with Disney Licenses (Target, Big Lots, JC Penny) and search for Disney holiday accessories to bring with you! This tip is extremely important. I mentioned above that Orlando temperatures have a very wide range during the winter months. Because of this, checking the weather carefully before arriving at Disney is imperative to enjoying your holiday vacation. The week of your trip may be unseasonably cold. If this is the case, you do not want to be the only one at Hollywood Studios without a coat during Fantasmic. It’s not fun, trust me! Your days at Disney may also be quite warm. If so, be sure to pack shorts and breathable fabric tops. When preparing for a Disney vacation, it is okay to over pack! I recommend taking clothing items for both possible scenarios (even if your weather forecast says 75 and sunny all week). If you have never been to Disney around the holidays, the crowds can be somewhat of a shock. Be prepared in advance and be sure to pack a lot of patience. Keep in mind that most Disney dining locations will not have openings for walk ups. Reservations must be made several weeks (and often months) in advance. Also, take advantage of the FastPass Plus program. This allows you to bypass lines for the most popular attractions. The holidays are also a great time to do some Resort Hopping. Take a break from the parks during the most crowded times (mid to late afternoon) and visit some of the beautiful resorts. They are fully decked out for the holiday season. My must see is the life-size gingerbread house at the Grand Floridian! I know, that last one wasn’t really a packing tip. But, I couldn’t end a holiday post without it. Keep these tips and tricks in mind, and you will be sure to enjoy your Disney trip during the holidays. *We will be visiting the parks during the week of December 18. We would love to meet some of you! Leave a comment down below or tweet us @Guide4Disney if you will be around during the week before Christmas!